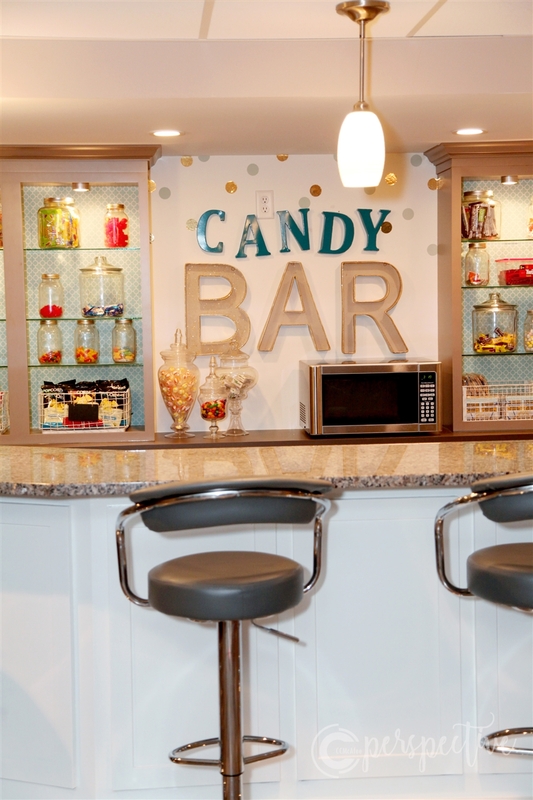 One of these post may become more popular than the other... to see all the hard work, before the final finish, check out The Candy Bar - Part 1! In that post I go over the decorative paper behind the shelving as well as painting the bar. This post is to show you the final little things, and of course the finished product! Here is where we left off... you can see that I had started cutting in with the white paint. I painted all the blue white. M asked if I'd paint the upper cabinets, but I didn't want to. For now the color doesn't bother me. I may change my mind down the road, as I get the rest of the basement done. They would be pretty white. The lowers are the same color and I don't want to paint those either! I like this color blue, again, just not for this space. I decided to replace all of the blue with white. That painting was pretty easy and didn't take too much time. I had previously bought the letters B A R, on clearance. They are gold. You can see those sitting out on the counter in my previous post. 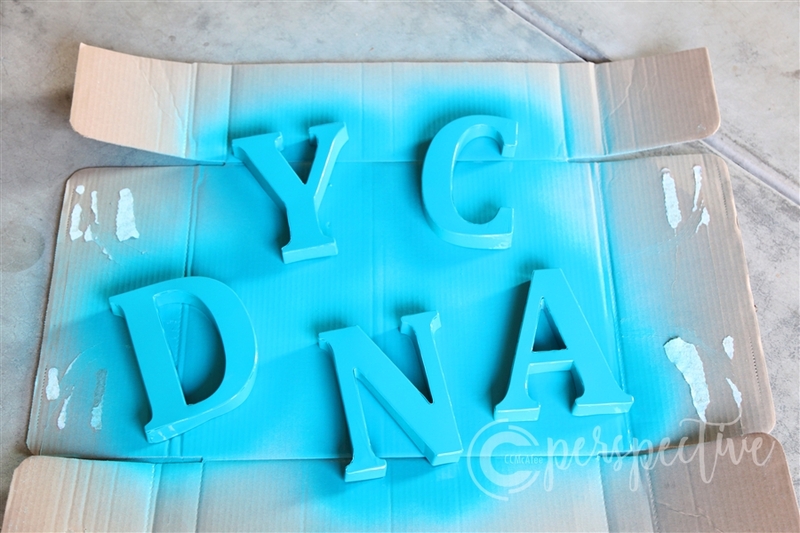 I also bought metal letters C A N D Y. These were black and I just wanted more color on the wall, so I primed them then spray painted them. I hung all of my letters on the wall. Of course I needed more excitement! I used my stash of wall stickers and sticky wall paper to create some polka dots. I punched them out with my scrapbook punch. Polka dots up on the wall... It looks like 'andy bar'!! And I'm done! M got us a mini fridge and we are set! I have been slowly changing out the mason jars with the fatter candy jars, and I really like these penny candy jars from Amazon. I would love one row to be all penny candy jars. It is always rotating, jars trading places, depending on what is consumed and at what rate! We also have a spot for sunflower seeds (which are also a staple), popcorn, popcorners and crackers. You have to have some salty to balance the sweet right? 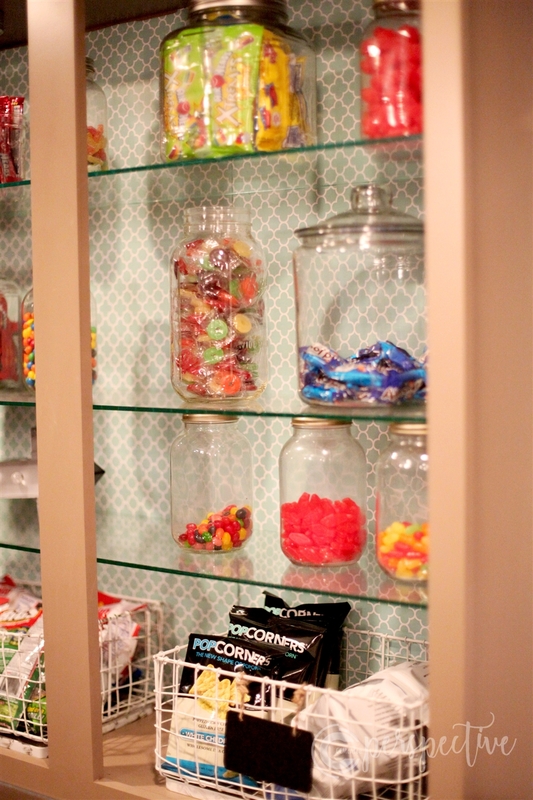 The number one comment I hear from people is they couldn't have all this candy in their house, or how do you keep your kids from eating it all? My kids are never the problem! They are trained, we always have candy everywhere and they know they can have a treat after lunch and dinner, and during movie time, and that's it! And, we are thoughtful about portion control! The offenders are usually guests in our home, that aren't used to such a smorgasbord of delight!!! We have had to have conversations about friends, and laying down the law about the candy bar! I'm happy to share, but let's show some respect and self control people!! It is nice to have it done and makes me excited to start transforming this basement space!